A.H. Systems' 3 models of Bilogical Antenna Kits operate efficiently over the frequency range of 25 MHz to 7 GHz. For rapid deployment along with the mobility of small package, these Bilogical Antenna Kits provides an inexpensive solution to broadband applications. Suitable for FCC, MIL-STD, VDE, TEMPEST, and immunity testing, each Bilogical antenna will provide reliable, repeatable measurements. The ability to sweep in one trace makes the Bilogical antenna a versatile performer. 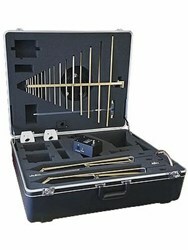 A.H. Systems offers 3 tuned dipole sets manufactured per the FCC design. Maximum performance, portability (compact size and lightweight), and rapid deployment make each of the Tuned Dipole Sets a reliable standout for field testing. Each component has a specific storage compartment in the carrying case therefore loss and breakage are virtually eliminated. Cables, a tape measure, balun mounting clamp and carrying case accompany each Dipole Set. Click on a model below to learn more about its characteristics and included antennas.